Four noteworthy people were inducted last night into the inaugural Honolulu Police Department Hall of Fame at a gala to celebrate HPD's 75th anniversary. The first ever to be inducted are Sgt. Edwin "Buddy" Adolphson Jr., Dan S.C. Liu, Sister Roberta Julie Derby and the only living inductee, Francis Keala. The fundraiser sponsored by the Honolulu Police Community Foundation, a private nonprofit organization, raised money for scholarships and HPD equipment. Adolphson, working much of the time on the North Shore, saved more than 100 people during his nearly 27 years of service with the department from September 1939 to May 1966. They included swimmers, surfers, fishermen, boaters and hikers. Derby became the first woman to serve as police chaplain in the United States and was the only HPD chaplain to receive the HPD's Warrior Silver Medal of Valor. She earned it in 1980 by defusing a hostage situation. Liu, the first American police chief of Chinese descent, was the fourth and longest-serving police chief -- 21 years, from October 1948 until he retired in July 1969. The department gained national prominence under Liu's term, which was noted for strict enforcement programs, improved working conditions and benefits, and top-notch police training. Most of his changes remain in place, including the redesigned police badge and establishment of the chaplaincy corps, canine corps and Police Activities League. 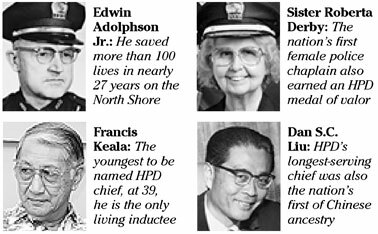 At 39, Keala became the youngest to be selected HPD chief, serving from December 1969 to April 1983. He established innovative and elaborate tactics such as sting operations and Operation Hukilau and Green Harvest operations to combat the growing drug problem. He expanded Internal Affairs to include annual inspections of personnel, equipment, vehicles and records. He is credited with instituting nationally recognized recruiting and training programs, crime trend analysis and establishment of a community relations division to promote public involvement in fighting crime.